Blizzard's unique new title "Overwatch" has been highly anticipated around LAN Mob. Almost every regular here has shown interest in the new arena class-based shooter as well as most of the employees. This weekend Blizzard ran an open beta (May 5th - May 10th to be exact) and, to no surprise, it was an absolute hit in the LAN Center. I've personally managed to put 22 hours into this Beta, playing whenever I could, with anyone willing to play. Overwatch is best described as a class-based arena shooter. If I had to compare it to an existing title, I guess it matches up best with Team Fortress 2. Players get to play 21 unique heroes, with special abilities and play styles that fall into 1 of 4 categories (Offense, Defense, Support, Tank) in a few game modes spread out over 12 maps. 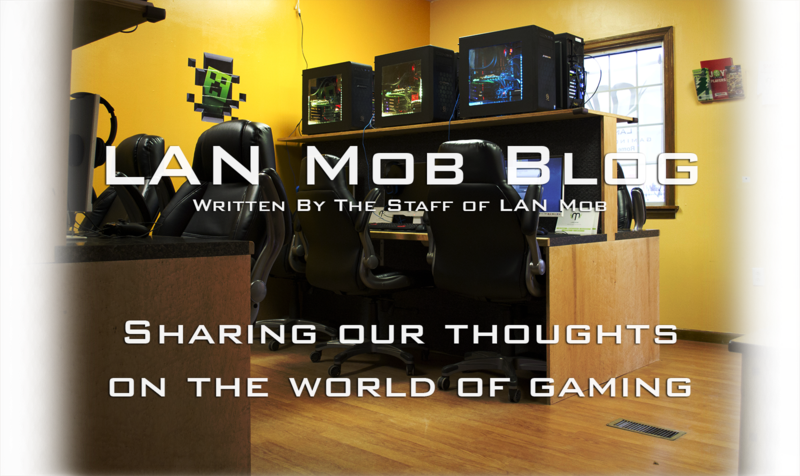 I couldn't possibly describe everything in detail but there are definitely some heavily notable favorites from each category around LAN Mob. A favorite hero among regulars like MattBGames and Taggles is Reaper. A shotgun wielding, skull faced avatar of death, Reaper is one of the offensive heroes flourishing in close quarters combat. Reaper has very high mobility, with a teleport and an invulnerable movement option, he can get where he needs to go and generally be quiet about it, which is important, because Reaper is incredibly weak at medium and long range. Decimating tanks with his shotguns, Reaper is great at removing defensive champions from objectives, and defending them himself. Reaper's Ultimate "Death Blossom" is a powerful AOE that can clear out a pretty wide area of all threats. My personal favorite trait of Reaper is his passive, "The Reaping" which allows Reaper to pick up a small globe on any enemy hero that he eliminates, which heals him for a percentage of his health. A simple but very important offensive hero, I'm glad to have a solid Reaper on any team. Another general favorite of our regular DoomMuffins and our one and only employee Enrique, is a tank hero named D.Va. An ex-pro gamer from South Korea, this 19 year old hero pilots a mech! D.Va's mech has an incredible amount of armor and is equipped with twin short range fusion cannons. D.Va's cannons are incredible in the sense that they never need to reload or cool down and can fire continuously, but greatly inhibit all mobility while doing so. D.Va's mech is also equipped with a defensive matrix that, when activated, will null any projectiles fired into the matrix, making her an incredible front line while she has her cooldowns. D.Va can also activate her mech's thrusters to quickly re position or disrupt enemies by smashing into them. D.Va's most unique trait is that when her mech is destroyed or if she opts to destroy it herself via self detonation, D.Va gets ejected from the mech and is controllable, wielding only a weak pistol. She can re summon her mech when she gets her cooldown back. Good D.Va players are terrifying, re positioning and absorbing powerful cooldowns, D.Va can completely change the tempo of a game. The unanimous respected support among all regulars and employees is Mercy, a Swedish Dr. who decided to build an angel suit to relieve the damage of war (this games lore though...). Mercy is the best healer in the game, equipped with a laser beam that heals allies, very similar to TF2's Medic. The laser also has an alternative fire mode that buffs the damage of the ally you are attached too. Mercy is also equipped with a modest side arm, but has no heavy damage. Mercy can also use her wings to glide towards almost any ally in her line of sight, making her incredible at keeping health bars topped off. The strongest tool a Mercy player has is her ultimate, "Resurrect", which does just that. On a very long cooldown, Mercy can revive fallen comrades in a small area, which has swung multiple games in our favor. Mercy is incredibly powerful, and in my personal opinion, will be on every competitive Overwatch team. The other support heroes are great, but Mercy's kit is really designed for objective control and resistance. My personal favorite Hero in the game is Genji, the offensive cyborg ninja. However, for the sake of covering all the bases, I'll describe my favorite defensive hero, Hanzo. A modern day ninja, Hanzo is equipped with a recurve bow capable of firing multiple different arrow types for different strategic situations. His default arrow is simply an arrow, capable of cover fire from a long distance and even short range pot shots. Hanzo can also activate a sonar arrow that will track all enemies in the vicinity of the arrows radius, giving vision through terrain. One of Hanzo's offensive arrows is called the "Scatter Arrow". This arrow fragments and ricochets off terrain upon impact, being incredibly good at flushing out enemies, or firing into small hallways. Hanzo's ultimate can be best described by "what was that!?" to newcomers of the game. Hanzo fires an enormous spirit dragon that soars through the air in the direction it was fired, devouring all enemies in it's path. Hanzo is both offensive and defensive if you're accurate with him, and is all and all pretty dangerous.Your best bet to deal with one is rushing him down, but be cautious, he can still peg you at short range. Despite a few blaring issues in balance, Overwatch has been quickly adopted into the everyday life at LAN Mob, being played somewhere in the shop ever since the Beta opened up. Blizzard has said they will be re balancing the game for it's release on May 24th, and I'm ecstatic to play more with everyone at the shop.